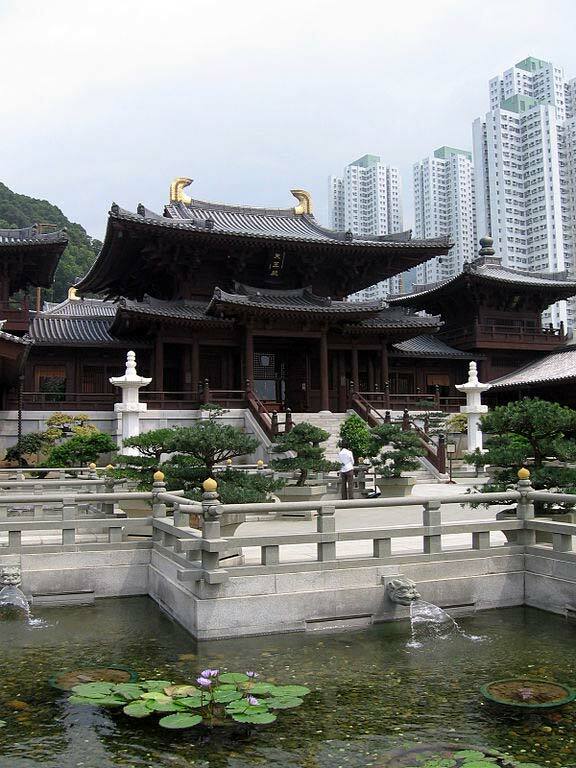 The Chi Lin Nunnery is located in Hong Kong and is a Buddhist temple. This large complex can be found in Diamond Hill of the Kowloon urban area. This nunnery monastery complex has beautiful Tang dynasty architecture. The area also has many lotus ponds. The complex is about 355,200 square feet and includes the nunnery, temple halls, vegetarian restaurant, Chinese gardens, and visitor’s hostels. The temple halls and the garden in front are free to visit and are open daily. It was built in 1934, and then rebuilt during 1990’s, adopting the traditional Tang Dynasty architectural style. Today’s buildings have wood frames that do not have any iron nails. Construction was based on traditional techniques that date back to the Tang Dynasty. This technique consisted of special interlocking systems that are cut in the wood that holds them together very securely. The buildings are the only structures to have been constructed using this ancient method in contemporary Hong Kong. This serene complex has peaceful lotus ponds, bougainvillea flowers, and perfect-looking bonsai tea plants. Silent nuns deliver offerings of rice and fruit to Buddha and arhats. Arhats are Buddhist disciples that have been freed from birth and death cycles. They also chant behind elaborately carved screens. 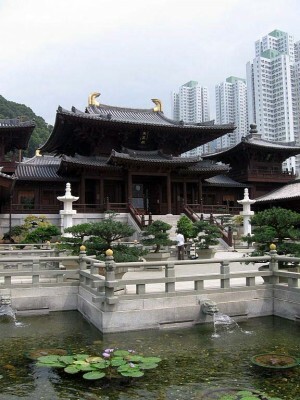 Visitors enter the Chi Lin Nunnery complex at the Sam Mun, which is a grouping of three gates that represent the various Buddhist precepts of skillful means, compassion, and wisdom. The first courtyard area has a large pond garden, which leads to the Hall of Celestial Kings, and this area has a very large seated Buddha statue. Behind the statue is the main hall, and it contains statues of the goddess of mercy Guanyin, and Sakyamuni Buddha, as well as other bodhisattvas. The statues were made with wood, clay, stone and gold.